While most household waste in the UK is deposited into sewers, customers in more isolated rural areas may not necessarily benefit from a mainstream sewage system. In these circumstances, a septic tank is an essential addition to their property. 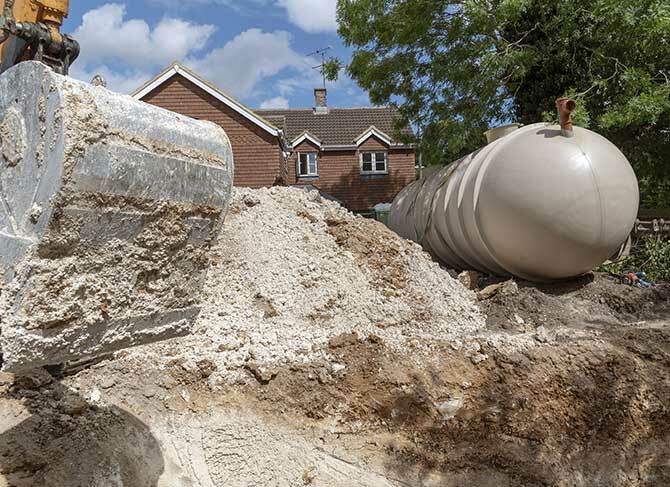 At M J Groundwork Services, we have been installing and maintaining septic tanks for our customers in Theydon Bois, Chigwell, Romford, Brentwood, Epping, as well as across Essex and Hertford. In that short period of time we have already developed an impressive reputation for the quality of our work, and the hygienic standards of our installations. Do I need a septic tank? If your property is already plumbed into the main sewage network, then it is unlikely that you require a septic tank. Even with the most recent innovations, septic tanks are not the most efficient method of waste disposal and, without regular care, maintenance and, of course, emptying they can produce an unpleasant odour, and potential health risks. If you live in an isolated community that is not hooked up to the main sewage network (and you will doubtless already be aware of this), then a septic tank is absolutely essential. They are also regularly installed in rural caravan sites, where there is no direct access to the sewers. What kinds of septic tank are available? There are two main types of septic tank – a traditional rectangular septic tank and the more modern “onion” septic tank (so called because of its bulbous shape and narrow neck). Of the two, the rectangular tank is the more effective, though it does attract a considerably higher price tag when installing. In short, household waste is deposited into the tank, where the liquids and solids separate. Fats and oils coagulate into a floating layer on the top of the tank, while faecal matter and food scraps form a sludge layer at the bottom, where they are digested by anaerobic bacteria introduced to the septic tank. The water layer is drained off, and the solid matter needs to be removed manually at least once a year. Based in Sawbridgeworth, our team of septic tank installers cover much of Essex and Hertford, including Theydon Bois, Chigwell, Romford, Brentwood, and Epping. 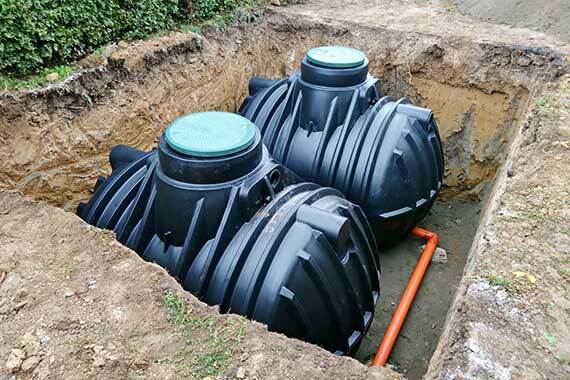 Our team have been installing high quality septic tank solutions for our clients across Essex for many years. Between them, our team of engineers have over five decades of experience with septic tanks, ensuring a safe and secure installation every time. For all your septic tank needs, call M J Groundwork Services today on 07885 577 899, for a free quote.